Ring Command bezel, are polished/brushed. 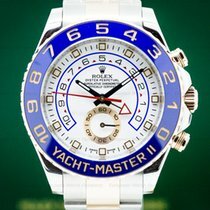 The bezel has a blue Cerachrom ceramic insert, with gold engraved numerals and the Yacht Master II inscription. 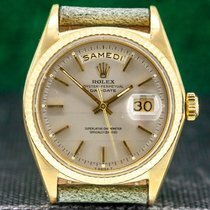 The dial is white with yellow gold skeletonized Rolex hands with luminous inserts, yellow gold square hour index markers with luminous inserts, a gold triangle at 12 o'clock, and there is a perimeter black minute/second scale. It includes a center sweep chronograph hand, and a fourth center hand with a red triangle indicator for the arched programmable countdown Regatta chronograph with a blue rim, red triangle markers, and black Arabic numerals to 10, with an "on the fly" mechanism. There is a running small seconds subsidiary dial at 6 o'clock with a gold reserve with black Arabic numerals, and a gold indicator hand. 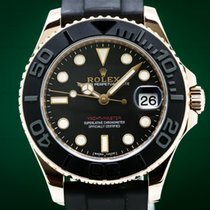 It has a stop-seconds mechanism for precision time setting, and it includes a Certified Official Superlative Chronometer (COSC) rating. It's water resistant to 100 meters/330 feet, and the 14mm thick case, dial, and movement are all signed.